We're showing a few clips here of the as yet unreleased "The Shred Remains" snowboard video by Rome SDS. Stay tuned 'til the end where MFR calls it "highly illegal" to show these clips in the quick interview at the end and Johnny Lazz....well, you'll just have to check it out. We talk to Marie France Roy about her handplant, LNP feels the love, and Riley Nickerson says "Boston is awesome" (which we know 'cause it's our home town.) The crowd at Boston University's GSU gets lots of schwag and leaves happy. Btw, hats off to Rome again for the 2007 Londonderry Pop summer rail jam and film premiere for By Any Means at Timber Ridge, which was one of the best snowboard parties ever (before it devolved into furniture burning) and if you missed it or just want to re-taste it, it's here on SnowboardSecrets.com. Burlington, VT - Burton HQ hosts the party of the Pre-Season Saturday August 13, 12 AM to 3 AM (that means late Friday night!). Store re-opens for Winter Storm Shelter Party 10 AM to 7 PM. The new Burton snowboards, boots, clothes and gear will arrive and be ready for purchase! A $1000 platinum gift certificate for Burton gear will be hidden in a catalog for one lucky guest! Gift bags for the first 13 customers to purchase Burton Gear. Food from 12 to 5, and tunes. Can't make it to BTown? The 2012 Burton gear hits shops nationwide on Sat. August 13, so you can shop local. Click on the link for fun videos of Danny Davis, Luke and Jack Mitrani, Kevin Pearce and others as newscasters announcing this sale! The Rail Jam. And interviews of Jordan Parks, Jordan Ghianni, and Eugene Stancato who lists off the winners from today. See also the pre-cap - it has different footage. See the Limbollie contest that Rob Hallowell won by ollying 36 inches. And the mini-slopestyle comp. 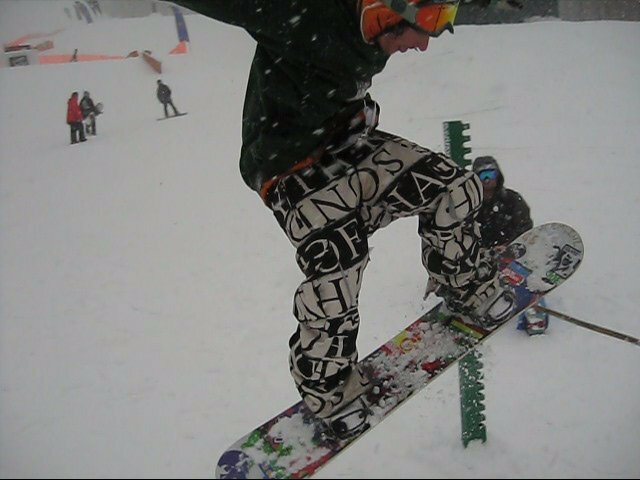 We interview Tim Sullivan from the Mount Snow Terrain Park Crew. Interview with Dylan Peters and Matt Nardiello of Bill Enos' Waterville Valley Team. Then see the mini-slopestyle contest, and the rail jam. The 3 main contests also included a big air, and riders were judged on overall impression on all 3 courses. The contest was March 16, 2011 at Loon Mountain, in a blizzard and is one of the last contests in the East that does not require helmets and does not include skiers. In the longer vid see interviews with Tim Sullivan of the Mount Snow Park Crew, Jordan Parks, and Jordan, Events Manager at Loon, and Dylan Peters and Matt Nardiello from Waterville. Zack Normandin was on the podium today as well as yesterday at Waterville's Back to the Boneyard. See his early season rail jam footage and interview at Nashoba here on SnowboardSecrets.TV under "Nashoba Freeride Series Rail Jam."